It got quite idyllic by the afternoon - the sea was just to the left. We continue to be inexorably sucked onto massive Thai highways despite all our efforts to avoid them. The much looked-forward-to coast road proved not to be continuous - rather the beachfront was a series of high-rise hotels and condominiums and goodness knows what lifestyle apartment complexes. Of course the denizens of such places didn't want riff-raff like us pootling through their exclusive environs so it was the dreaded route 4 for us again for much of the way, though at coffee time we did manage to gatecrash a very exclusive small hotel and have drinks on a sun bed. In the afternoon, too, Walt managed to lead his ducklings off the highway and through some pleasant gentle hills to arrive after a gentle 80km or so at this little bungalow-style hotel right by a quiet beach at Sam Roi Yot. Half the team went for a dunk in the Gulf of Thailand (temperature - warm bath). The contrast with the condo-strip could hardly be greater. 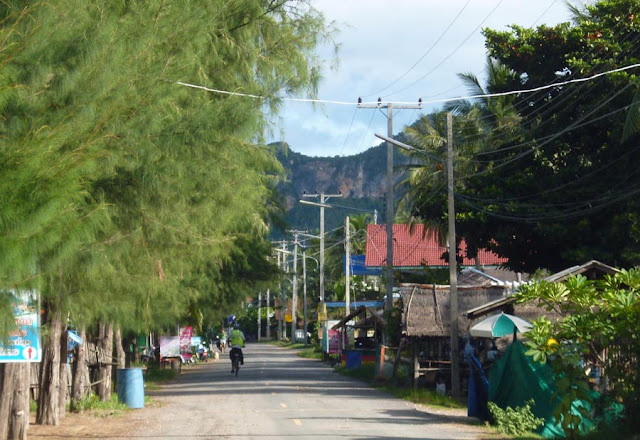 A little potholed road runs along the beach with a few modest restaurants and the like straggling along it; some half-built but long-abandoned holiday chalets on stilts, brightly painted boats, some kids playing volleyball on the sand, a small handful of fat white people propping up bars. (we know all this because - yes! - we arrived in daylight!) The word sleepy comes to mind. Or at least it did until the damn karaoke started. Actually it was a proper band this time. Worse, because karaoke is usually just a keyboard - this was 2 guitars, bass and drums, all amplified so the people at the back, about 15 feet away, could hear. This was in the little hotel's open air bar/restaurant, where dinner was quite good (though Al's green curry wasn't green but white, as they assumed the green spices would scare him), but had to be curtailed quickly when the band started. I think Honky Tonk Woman was probably the low point, though it was all bad. Surprisingly, we were the only ones who made a quick exit - the fat white people seemed to quite enjoy it, in a glazed-over kind of way. Tomorrow we get up early. Ha! Hilarious I laughed from beginning to end, I know your writings anywhere Al, Peking duck yummo, I feel Mother/Father duck a little tough! When you have bad days they are horrific, hopefully days like this make up for it all. Ah hard to imagine Honky Tonk Woman with a Thai twist, ROFLMAO.